Modern Leather Holsters, mini-holsters : a touch of Old West craftsmanship in today’s world. 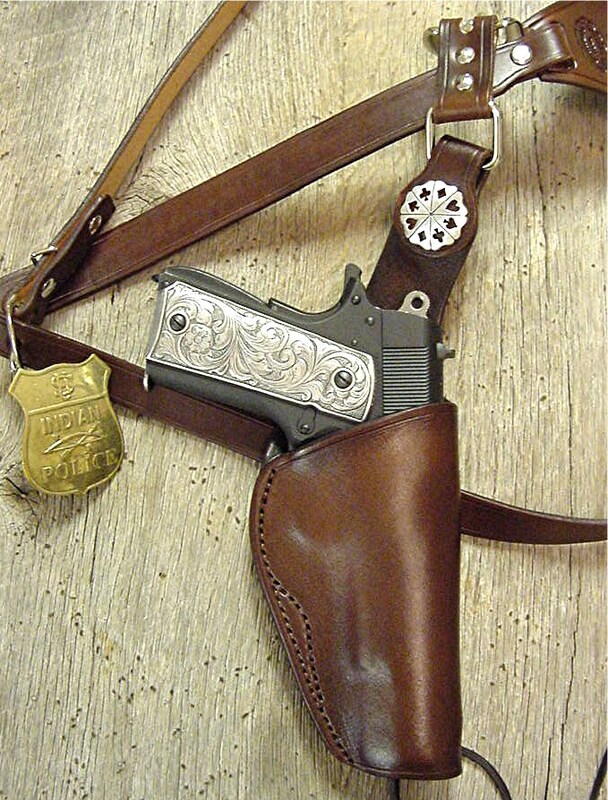 Modern leather holsters custom made by Chisholm’s Trail Leather just for you. We do not mass produce these works of art. We make these modern leather holsters one at a time, as you order them. In the Old West, these were highly functional receptacles holding a cowboy’s pistol: his protection against threats that abounded nearly everywhere. Chisholm’s Trail has made modern improvements, especially in functionality. The Soellners have trade secret treatments they make to the interior and wearing edges of their modern leather holsters that allow you to draw your weapon faster than the cowboys of old. So much so, that a Florida Highway Patrolman sporting one of Chisholm Trail’s modern leather holsters was able to out draw a criminal during a traffic stop and terminate the threat. He swears that the time saved by the quickdraw design and features of his Chisholm’s Trail modern leather holsters saved his life. #MH-1 – DOUBLE ACTION SNAP – Slightly forward tilt double action holster with hammer strap and snap. Made to fit Smith & Wesson, Colt and other modern pistols. #MH-2 – BELT SLIDE HOLSTER – Very comfortable belt slide holster for Colt Auto, Baretta, Glock, SIG, Browning, S&W revolver or Colt Single Action. Available in Natural, Black, Brown or Tan. 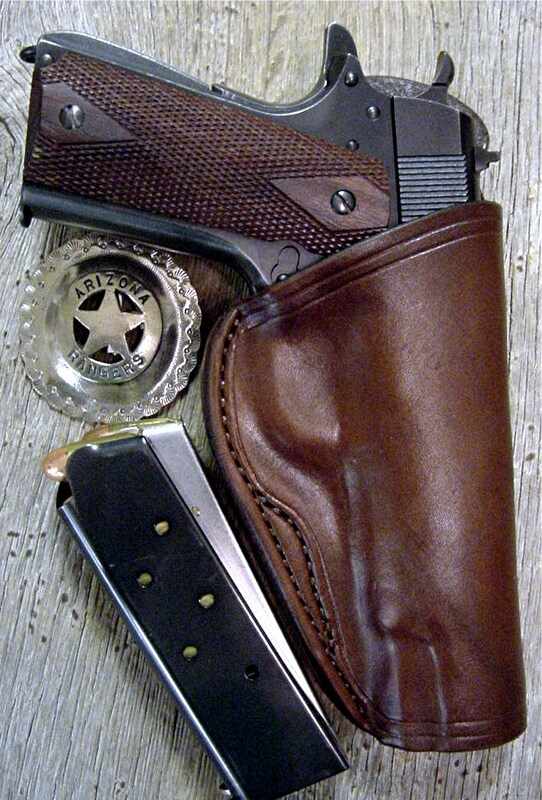 MH-3- ARIZONA RANGER – Straight or cross draw belt holster for a Colt .45 Auto or clone. Can also form for Beretta, Sig, Browning HP or Glock. Leather on back protects shirt from rubbing on sight or hammer. MH-4- AUTO SHOULDER HOLSTER – Right, left or double shoulder holster for a Colt .45 Auto or clone. Can also size for Beretta, Sig, Browning HP or Glock. Strap crosses chest for secure mount. Each holster secures to pant belt or suspender buttons. Add concho – $10.00 each. tags for social media: modern leather holsters, mini-holsters.